April is examination time, when the results of your cultural program over the previous nine months become apparent. 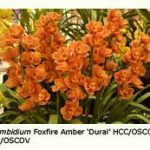 If you have lush, green leaves but few flower spikes, then perhaps you have been feeding your cymbidiums too heavily with high-nitrogen fertilisers. A more balanced fertiliser formulation, coupled with plenty of light, should give yellow-green foliage and more flower spikes. Both flower spikes and new growths emerge from the base of the pseudo-bulbs. The new growths are usually more sharply pointed than the flower spikes. The latter are often softer but I am not in favour of the ‘squeeze’ test to differentiate them, because of the possibility of damaging the concealed buds. The flower spikes of pendulous cymbidiums sometimes head straight for the rim of the pot. If they are allowed to reach it, they may abort or burrow back into the potting mix. Even if they manage to find their way up and over the rim, their stems may have unsightly twists or kinks. This possibility can be avoided by placing a plant label or other flexible piece of plastic under the developing spike, so that it is gradually forced to climb up and over the rim. 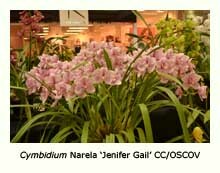 When I first discover a cymbidium in spike I turn the pot so that the spike(s) face the direction of maximum light (usually north). Eventually most of the flowers should then face the same direction. 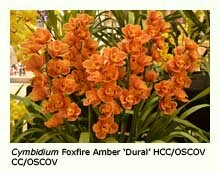 Of course, if your cymbidiums have spikes all round, then you don’t need any advice from me, as you’re a much better cymbidium grower than I am! Having decided which way the pot should face, then stick with that decision and don’t turn the pot again, especially if the buds have emerged from the sheath. 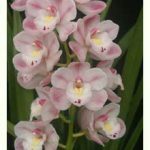 Cymbidium spikes respond very rapidly to changes in the direction of light, and will twist or kink to face the light source within a day or two unless very firmly staked and tied. 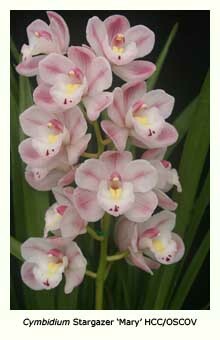 There are several schools of thought on when cymbidium spikes should be tied. Some growers insert their stakes as soon as the spikes appear, and apply the ties as soon as the buds begin to emerge from the sheath. Others stake and tie on show day! I favour somewhere between the two extremes. 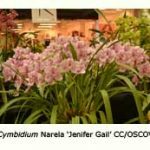 It’s important to differentiate between those cymbidiums with upright spikes and those with arching or pendulous spikes. The latter look ridiculous if staked upright. Aluminium stakes are better for arching spikes, as they can be bent to follow the natural curve of the spike. It’s a good idea to label those plants with pendulous or arching spikes, so that you remember to give them special treatment each year. Green cane stakes are the most unobtrusive, so much so that it’s easy to poke your eye out while searching for new spikes! A handy hint is to cover the top with a piece of plastic foam. But please remove it, and trim back the stake so that it is a little shorter than the flower spike, before staging your plant on the show bench. Some growers train their cymbidium spikes upright using hat elastic. A slipknot is tied at one end of a 20 cm length of hat elastic, and pulled tight just below the penultimate bud (second from the top). The other end is slipped beneath the metal spring of a wooden clothes peg. The peg is then slid up the stake so that the elastic becomes reasonably taut. As the spike elongates, the peg will need to be slid further up the stake to maintain the tension. This procedure helps to keep the spike straight, and may also improve the spacing of the flowers. Be careful! If the elastic is tightened too much, the topmost buds can become very widely spaced from the lower ones as they fly over the neighbour’s fence!! The Nie-Co-Rol® is a spring-loaded device that achieves the same result as hat elastic without the need for periodic adjustment. The device is tied to the roof of the orchid house, and the hook pulled down from the spring-loaded reel and fastened below the penultimate bud.